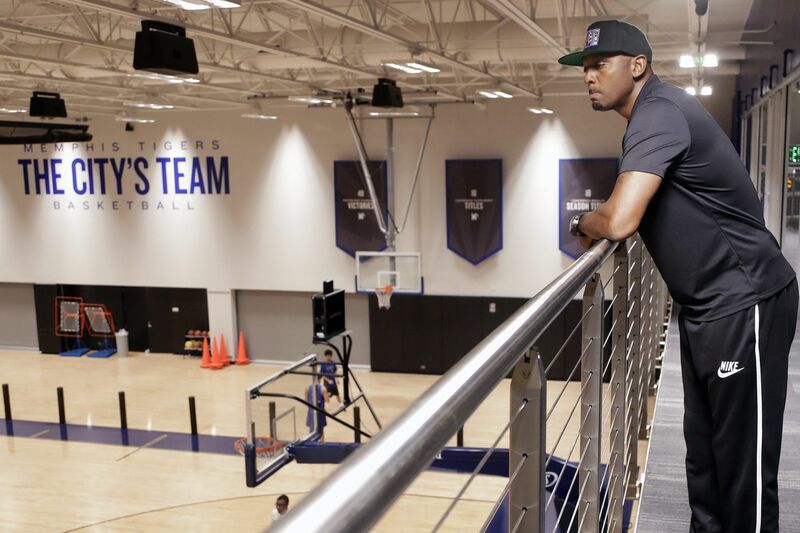 Memphis basketball coach Penny Hardaway looks over the practice facility in Memphis. Penny Hardaway did not need to be the head basketball coach at the University of Memphis. He earned more than $120 million during his NBA career. He was revered in his hometown of Memphis – first as the Parade High School Player of the Year who spurned offers from many other programs to go to what was then called Memphis State University. When he retired after 15 seasons in the NBA, he came back to Memphis and committed himself to philanthropy. He created and funded programs designed to use sports to create opportunities for youth in his city. He donated $1 million to the construction of the University of Memphis Sports Hall of Fame. Hardaway could have just as easily been recruited to run for mayor of Memphis when the university approached him in March. "Talk about full circle, I never saw this coming," Hardaway said Monday at basketball media day for the American Athletic Conference, which also includes Temple. The event was held at the Philadelphia Airport Marriott. "It wasn't like I said, 'Someday I want to be the head coach at the University of Memphis.' Now that it is here, coming back full circle has been amazing. The energy in the city has been phenomenal." Playing its first season in 1920-21, the Memphis basketball program is up there with the blues, Elvis Presley, and barbecue ribs as a fabric of the city. The Tigers have been to three Final Fours and played in two national championship games. They've also seen one of those championship-game appearances, two Final Fours, and five Sweet 16s vacated by the NCAA because of rules violations. Their fan base, however, is one of the most passionate in college basketball, and after seeing their team miss the NCAA Tournament the past four seasons, supporters of the Tigers are thrilled at the prospect of Hardaway, who led Memphis to the NCAAs in both of his two seasons as a player, turning things around. The Tigers, who finished 21-13 last season, were picked to finish third in the AAC preseason poll, behind Central Florida and Cincinnati. Temple was picked for sixth in the 12-team conference. "We had 18,000 people show up for Memphis Madness, which is really just a pep rally to introduce the team," said Hardaway, who was the No. 3 pick in the 1993 NBA draft, right after the Sixers took Shawn Bradley. "They're already showing their appreciation for me coming back and trying to rebuild and put the university back to where it has always been in the past, which is on top." Memphis State’s Anfernee “Penny” Hardaway (25) colliding with Western Kentucky’s Bryan Brown during an NCAA Southeast Region game in March 1993. This is a high-stakes roll of the dice by Memphis. Other than AAU and a few successful seasons in middle school and high school, Hardaway, 47, has no coaching experience. Memphis is banking that the acumen that made Hardaway a first-team All-American in college, a four-time NBA All-Star, and a 1996 Atlanta Olympics gold medalist will translate into a successful coaching tenure. Hardaway knows that his legacy as a player, especially in basketball-rich Memphis, might help him get a foothold in recruiting. He also knows that recruiting will be only part of the equation. Hardaway hired former NBA Coach of the Year Sam Mitchell as associate head coach. He brought in former Memphis point guard Tony Madlock, who has a decade's worth of experience as an NCAA assistant. His staff also includes recently retired, two-time NBA champion Mike Miller, who played seven seasons for the Memphis Grizzlies. "The NBA is my history," said Hardaway, who along with Shaquille O'Neal led the Orlando Magic to the 1995 NBA Finals. "I know that's where I learned a lot of things that I can bring to this level. "Today's athletes want to go to the level after college, and that is the NBA. They want to go where I've gone. That's a selling point that you have to use." Memphis basketball coach Penny Hardaway talks about his new job in the school’s basketball offices. However, Hardaway is also determined that, under his watch, Memphis will not again become so focused on the court that it gets into the situations like the ones that caused former coaches Dana Kirk and John Calipari to have their teams' Final Four appearances erased from the NCAA record books. Hardaway, whose trajectory to a Hall of Fame career ended because of a devastating knee injury during his sixth season, had sat out his first season at Memphis as a Proposition 48 athlete. When he left after his junior season for the NBA, he had a 3.4 grade-point average and was on the dean's list. He returned to Memphis and completed his degree in 2003. "As an athlete, the body can fail you," Hardaway said. "I know. The mind and your education will be there to keep carrying you." Still, the bottom line is going to be about Memphis winning — titles in the AAC and games in the NCAA Tournament. "I've always loved this university and this city," Hardaway said, "but I'm finding out that maybe it is even deeper than I thought. "Once I made the decision, it made me realize that maybe this was something I'd always wanted to do but never put it on the forefront. Now the timing is right, and my goal is to get Memphis back to where it is supposed to be."